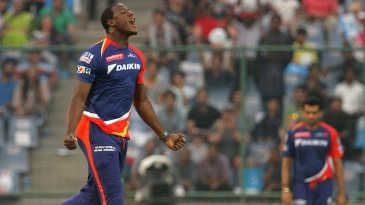 Half-centuries from Karun Nair and Sam Billings steered Delhi Daredevils past a poor start and an 11-ball 34 from Carlos Brathwaite provided the late thrust that lifted them to 186. Daredevils defended it with regular strikes that destabilised a Kolkata Knight Riders line-up of considerable depth, eventually bowling them out with nine balls remaining. Robin Uthappa held the chase together with a 52-ball 72, but wickets fell around him - Zaheer Khan did the early damage, while Brathwaite took three wickets in the middle overs.